New homes and buildings were required to be better insulated and fitted with energy-wise lighting, heating and cooling systems. Appliances had to be designed to use less power. Utilities were forced to motivate their customers to use less electricity. ….Not surprisingly, those rules were attacked by business groups as bureaucratic job killers. Rosenfeld, who received his doctorate from the University of Chicago, was called unqualified by critics at Pacific Gas & Electric Co., one of California’s largest utilities. Yet these mandates have yielded about $30 billion annually in energy savings for California consumers. They’ve eliminated air pollution that’s the equivalent of taking 100 million cars off the roads. They have been copied by states and countries worldwide. California’s gains are so closely linked to Rosenfeld that they’ve been dubbed the Rosenfeld Effect in energy efficiency circles, where the 83-year-old has taken on rock star status. Rosenfeld’s ideas, far from being job killers, have been a boon for California. We have plenty of problems here in the Golden State right now, but better energy efficiency isn’t one of them. In the end, Rosenfeld was right and his critics in the corporate world were wrong. 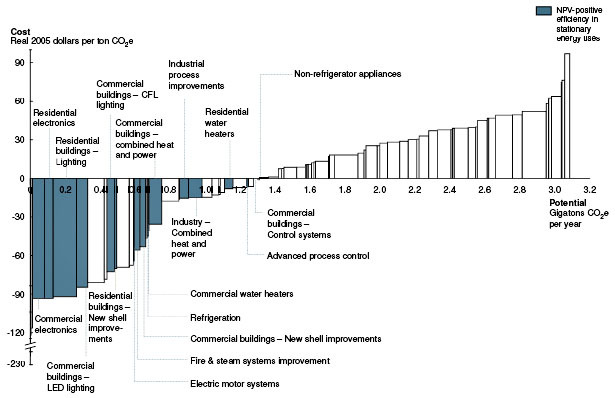 The point of the chart is simple: Some energy efficiency measures have a net cost and require fairly careful analysis to decide if they’re worthwhile. Those things are shown on the right side of the chart. But there are lots of efficiency measures that not only reduce greenhouse gas emissions but produce net cost savings at the same time. These are the low-hanging fruit of climate change, otherwise known as “no-brainers.” There are tremendous savings out there for the taking. The reason Morgan Stanley didn’t notice how much energy it was wasting, it seems, is because $100,000 was a (relative) drop in the bucket. The company wasn’t behaving irrationally — it’s just that those savings weren’t worth a lot of extra effort. But as carbon concerns have become more prominent, firms like EnerNoc are popping up and making it easier for the Morgan Stanleys of the world to cut that waste. Now, if we had a cap or tax on carbon, it’s reasonable to expect that you’d see even more attention paid to the issue, even more EnerNOCs popping up, and even more stories like the one above. As Jon Chait pointed out in his response to Gayer, one of the biggest impacts cap-and-trade could have is the simple signaling function — you’d just see companies and CEOs pay a lot more attention to the issue, which would make a galaxy of difference. There really is low-hanging fruit in practice, even if there isn’t in theory. Rosenfeld, I think, demonstrated that almost beyond doubt in California. Firms routinely overestimated the costs of regulatory compliance and routinely underestimated the cost savings. Some of this was ideological and some was just a case of hidebound management, but it was real. A nudge in the right direction can make a big difference, and if you pick the right nudge then energy efficiency often turns out to be pretty cheap. Sometimes even free.